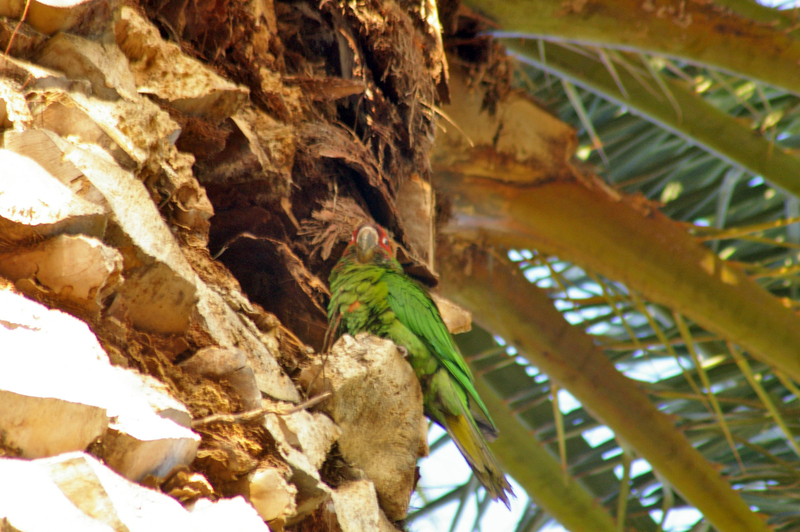 The mitred parakeet, also known as the mitred conure in aviculture, is a species of green and red parrot in the family Psittacidae. It is native to the forests and woodlands in the Andes from north-central Peru, south through Bolivia, to north-western Argentina, with introduced populations in California, Florida and Hawaii. Popular as as pet, they are considered outgoing and playful. 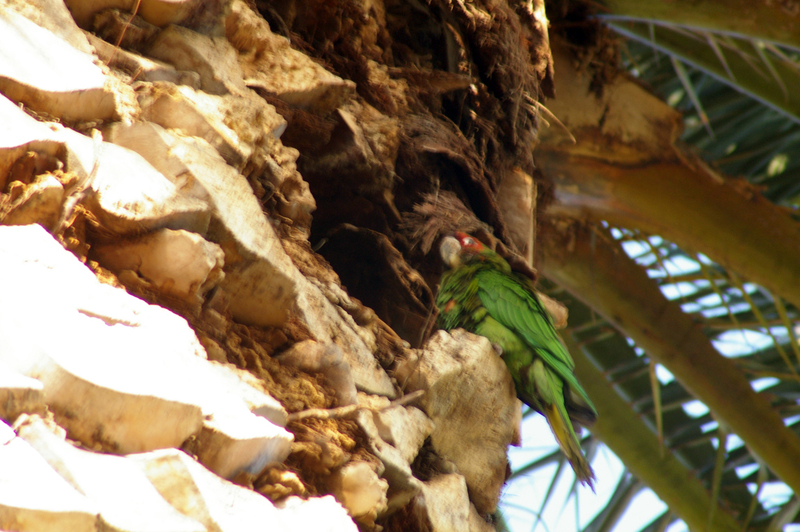 They are even used as "watch birds", given their loud, piercing alarm call. 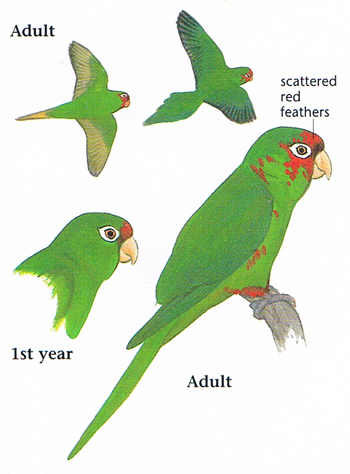 Fairly large green parakeet with red forehead grading into scattered bright red feathers on crown, face, cheek, sometimes on the bend in the wing. Dull green underparts are faintly washed olive. Hooked bill is dull yellow. Legs and feet are gray. 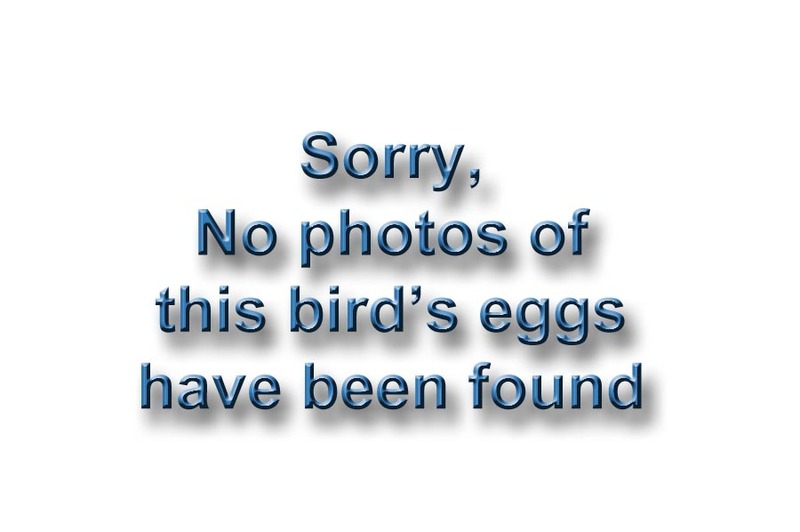 Green body; paler on breast and abdomen; forehead, forecrown and eye area dark red; red feathers scattered on the sides of the head, throat, nape, breast and abdomen; greater under wing-coverts as well as underside of flight and tail feathers goldish or olive-yellow; eye ring whitish; iris brownish-yellow; feet flesh-tone; beak horn-colored. Immatures as adult, but with only a red forehead. Some immatures may have barely visible signs of red. In its native range occurs in mountain valleys in a narrow band from southern Peru to northern Argentina. 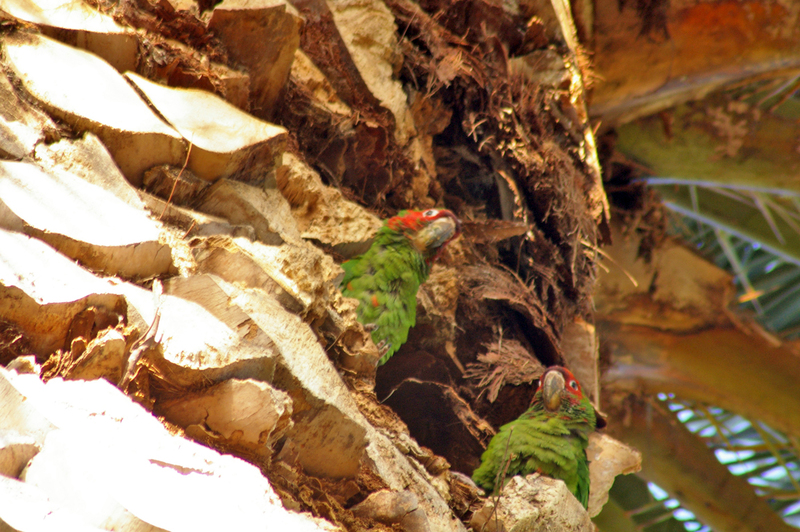 Populations of escaped birds also established in Los Angeles, California, and south Florida. Prefers dry subtropical forest, but also uses cultivated areas and grasslands with scattered trees. Frequently found near rocky cliffs. Travels in groups of 2 to 100 in search of fruit, berries, and nuts. Usually feeds in forests, but may visit open areas in search of grain. Feeds on fruits, berries and nuts. 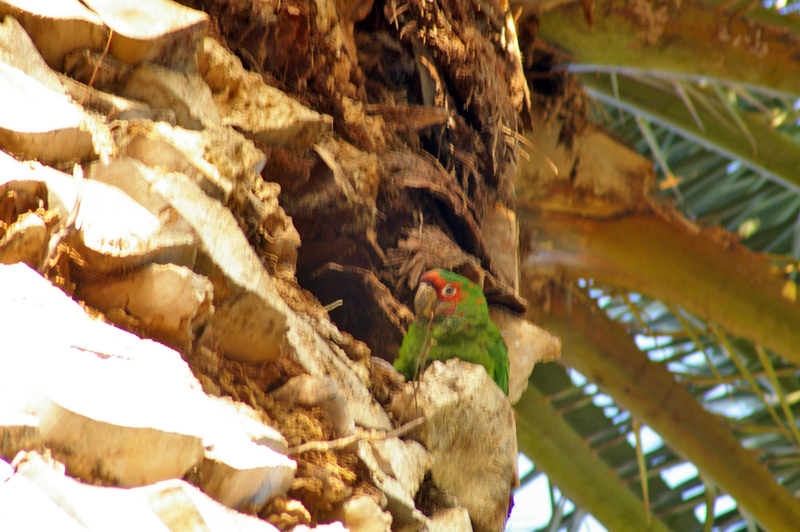 Red-masked Parakeet has more extensive red on head and leading edge of wing. 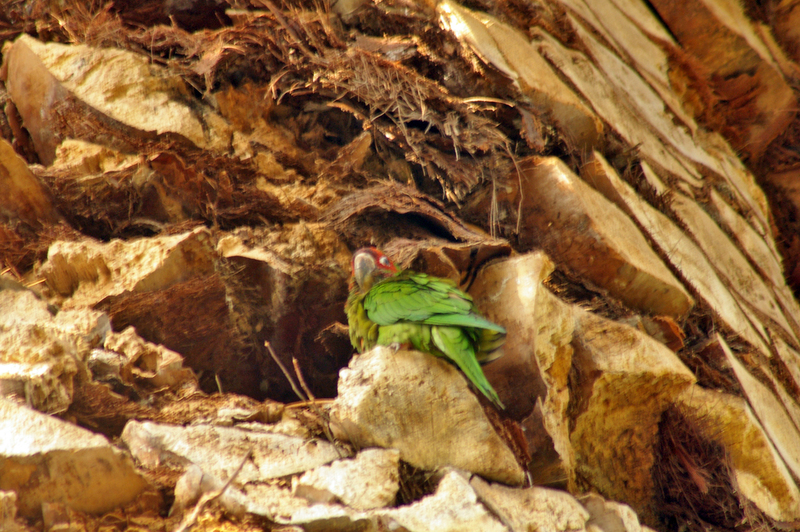 White-eyed Parakeet has conspicuous red and yellow patch on its underwing coverts.